The heart of Texas beats strong, fueled by the love between two men whose lives are interwoven like the long grass of the hill country they call home. Brandon Blackstun has spent the last decade moving on from the hellish halls of high school. With an invitation to his reunion in hand, he plans to show his former classmates that not only did the repeated occurrences of being slammed into lockers not cause brain damage, but he’s now a successful cover artist for the very books they buy off the shelves. Tyler Synder was determined not to follow in his father’s footsteps as head of the international corporation that bears the family name. Instead, his heart is tied to the beat of his horses’ thundering hooves. He operates a breeding program for Tennessee Walkers and a guest ranch a couple of hours from the urban luxury of Dallas where he was raised. The two men might live very different lives, but the heat between them is hotter than any Texas sun. With the help—or meddling—of an unlikely pair of friends, the two explore a relationship that stirs something deep inside them. Distance and misunderstandings force Tyler and Brandon to consider whether the fulfillment they’ve experienced in each other’s arms is worth the sacrifice of the lives they’ve built individually. Texas may be the second biggest state in the union, but is it large enough to embrace the love between these two men, or will their deeply hidden fears shatter the boundaries of their hearts? 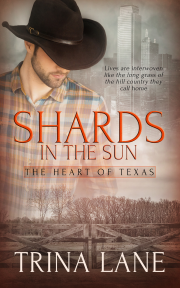 I am a huge fan of cowboy stories, but I have to say I have mixed feelings about Shards in the Sun. Before I launch into what I liked and didn’t like, I gave the book a solid 4 kisses because of some wonderful characters and scenes. Trina Lane has created two very likeable characters in Brandon and Tyler, and I liked their disparate backgrounds. Brandon’s job as a cover artist is close to my heart, and I love cowboys. I wasn’t so sure about some of their interactions and conversations, but I love their interactions with other people. My mixed feelings arise from the fact I was less interested in them as a couple, and more interested in the men with their friends and families. Overall, I was more captivated by the secondary characters than the main pair, and the author took time and care to give them depth. It was well done, and kept me reading to the end. I appreciated that the author didn’t use stereotypical tropes for the wealthy family, and the family dinner made me chuckle. I also appreciate that female best friend was treated with respect, and wasn’t a Mary Sue to be used and tossed aside. When I read a book, I don’t usually pay much attention to description and vocabulary unless it detracts from the story, but in this instance, it was evocative and spot on. Shards in the Sun has shown us a well-developed world, and I look forward to reading more in the series.